Mikhail Baryshnikov's breathtaking and critically acclaimed Emmy-nominated production. This spectacular performance is danced by the magnificent team of Baryshnikov, one of the greatest classical dancers of our time, and Gelsey Kirkland, both showcased at the peak of their careers, with members of the American Ballet Theatre. 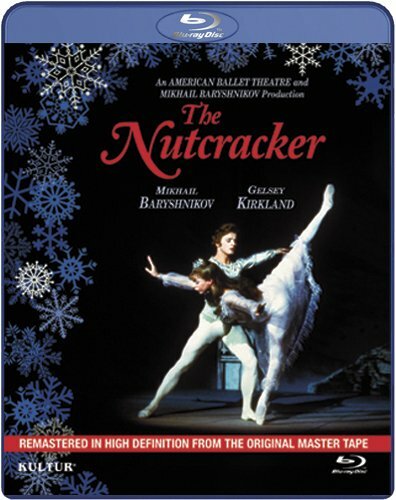 New York, NY (July 31, 2012) - Kultur is proud to announce the Blu-ray release of The Nutcracker starring Mikhail Baryshnikov, Gelsey Kirland and the ABT available on September 25, 2012. In going back to the original master tape and using cutting edge encoding technology we are able to maximize the quality of this new presentation of The Nutcracker in High Definition. The Nutcracker is Mikhail Baryshnikov's breathtaking and critically acclaimed Emmy(R) nominated production. This spectacular performance is danced by the magnificent team of Baryshnikov, one of the greatest classical dancers of our time, and Gelsey Kirkland, both showcased at the peak of their careers, with members of the American Ballet Theatre. The Nutcracker is the magical story of a small girl's dream on Christmas Eve. Mikhail Baryshnikov is the toy Nutcracker-turned-Prince in this exhilarating production that marked his initial and universally acclaimed choreographic effort. Gelsey Kirkland is little Clara, the dreamer, and Alexander Minz is Drosselmeyer, the wizard who conjures up the dream and eventually dispels it. Extravagant sets and costumes bring the beauty of this winter wonderland to life. The magical aspects will delight children, while the spectacular sets and performances will enchant and delight the child in all of us. Celebrated by critics and public alike, Baryshnikov's The Nutcracker delivers a brilliant and sparkling adaptation of the famous E.T.A. Hoffmann tale along with Tchaikovsky's classic score. VIDEO: This famous recording has been remastered from the original master tape (analogue 525 lines). After digitizing into the modern High Definition format (1080 lines), video restoration was undertaken to maximize the picture quality to the best image possible that can be derived from a video tape shot with a technology over 35 years old. AUDIO: The genuine LPCM audio track was created using all of the soundtracks on the original performance master tape.